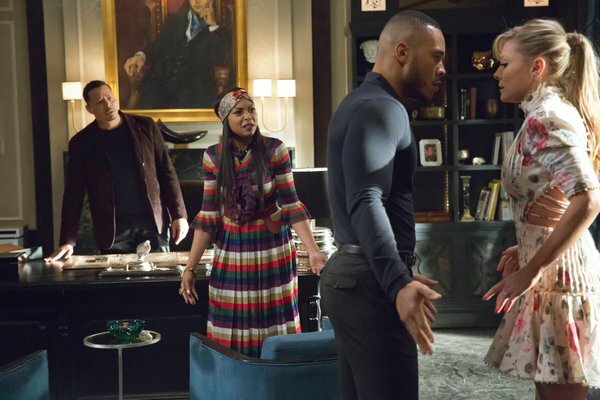 Empire‘s Season 2 finale was batsh-t cray-cray. Here are my stream-of-consciousness ramblings on the “Past is Prologue” episode. Why does Lucious wear a hat indoors? Doesn’t he know better? He probably eats with his elbows on the table and sends e-mails in ALL CAPS. Lucious needs etiquette lessons. I hope the show doesn’t think we are worried about Jamal being in a wheelchair. We know he’s not going to be in that wheelchair by the end of the episode. Spoiler: He’s not in that wheelchair by the end of the episode. Rhonda thinks that Boo Boo Kitty is the only woman in the world with Louboutin shoes. The assailant who pushed Rhonda down the stairs and caused her miscarriage had on red-soled shoes. That’ll never hold up in a court of law. Rhonda thinks it’s okay to choke and punch a pregnant woman. Rhonda was pregnant when she killed Vernon, buried his body and then dug it up so Boo Boo Kitty can’t really be a crybaby about this. According to flashbacks, Lucious’ father is dead. According to flashback’s Lucious’ mother was dead. Lucious-related flashbacks are unreliable. Oh, dear God, we’re still talking about Hakeem and Laura’s wedding. Zzzzzzzzzzzzz. I want to say something nice about Laura. I was hoping to say she had on a beautiful dress and she can’t even get that right. What’s that song being played on the strings? It’s familiar and this is going to drive me crazy. Okay, Laura is breaking up with Hakeem because reasons. Thank you, Baby Jesus. Oh, now I remember. It’s a string version of “White Wedding.” Bravo. Ooooh, the feds want Boo Boo Kitty to testify against Lucious for blah, blah, blah. And he’s marrying her so she doesn’t have to testify! Juicy. I don’t know what Boo Boo Kitty is so glum about, she was thirsty to be a part of this family even though everybody hates her. Rhonda is not one to be trifled with. Boo Boo Kitty really did push her so now she’s trying to push Boo Boo Kitty over a ledge. Did one of them die? Unacceptable. You can’t lose a character named Boo Boo Kitty or a character that chokes Boo Boo Kitty. That’s it? This is how the season ends? To read a full recap of the episode, head on over to The Root. You hit it right again. Your writing is so damned entertaining. I cringed when I saw that stupid hat on in the house!!! !